Agricultural and industrial activities generate large quantities of methane, a greenhouse gas that adds to global warming. A number of bacteria also create methane as a byproduct of their metabolism. Some of this naturally emitted methane originates from the ocean, an occurrence that has long mystified scientists as there are no known methane-producing organisms that exist near the ocean’s surface. 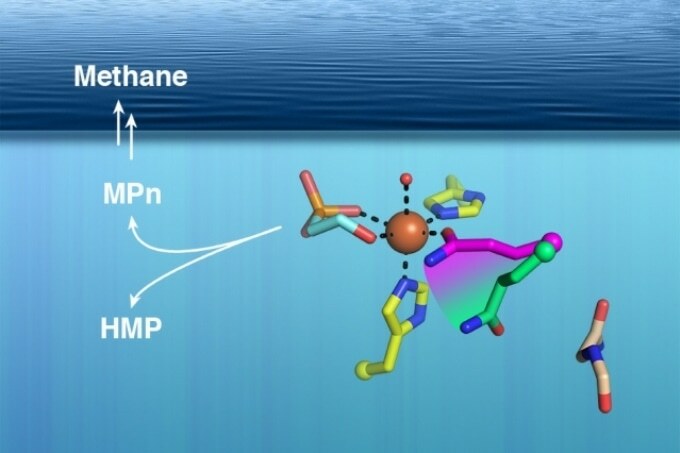 A discovery made by a team of researchers from MIT and the University of Illinois at Urbana-Champaign could help to answer this “ocean methane paradox.” First, they analyzed the structure of an enzyme that can create a compound that is known to be converted to methane. Then, they applied that information to demonstrate that this enzyme exists in some of the most abundant marine microbes. They believe that this compound is probably the source of methane gas being emitted into the atmosphere above the ocean. Ocean-produced methane represents about 4% of the total that is released into the atmosphere, and a proper understanding of where this methane is originating from could help researchers better account for its role in climate change, the researchers say. Understanding the global carbon cycle is really important, especially when talking about climate change, where is methane really coming from? How is it being used? Understanding nature’s flux is important information to have in all of those discussions. Catherine Drennan, MIT professor of chemistry and biology, Howard Hughes Medical Institute Investigator. Drennan and Wilfred van der Donk, a professor of chemistry at the University of Illinois at Urbana-Champaign, are the paper’s senior authors. The paper appears in the December 7 online edition of Science. Lead authors are David Born, a graduate student at MIT and Harvard University, and Emily Ulrich, a graduate student at the University of Illinois at Urbana-Champaign. Many bacteria create methane as a byproduct of their metabolism, but most of these bacteria live in oxygen-poor environments such as the digestive tract of animals or the deep ocean— not near the ocean’s surface. Some years ago, van der Donk and University of Illinois colleague William Metcalf discovered a possible clue to the mystery of ocean methane: They found a microbial enzyme that makes a compound called methylphosphonate, which can turn into methane when a phosphate molecule is cleaved from it. This enzyme was found in a microbe called Nitrosopumilus maritimus, which lives close to the ocean surface, but the enzyme was not easily identified in other ocean microbes as one would have anticipated it to be. Van der Donk’s team were aware of the genetic sequence of the enzyme, referred to as methylphosphonate synthase (MPnS), which allowed them to hunt for other versions of it in the genomes of other microbes. However, each time they found a likely match, the enzyme turned out to be a related enzyme called hydroxyethylphosphonate dioxygenase (HEPD), which produces a product that is quite similar to methylphosphonate but cannot be cleaved to create methane. Van der Donk asked Drennan, an expert in defining chemical structures of proteins, if she could attempt to reveal the structure of MPnS, in anticipation that it would help them discover more variants of the enzyme in other bacteria. To find the structure, the MIT team employed X-ray crystallography, which they performed in a special chamber without any oxygen. They knew that the enzyme needs oxygen to catalyze the making of methylphosphonate, so by removing oxygen they were able to procure snapshots of the enzyme as it bound to the required reaction partners but before it completed the reaction. The researchers compared the crystallography data from MPnS with the associated HEPD enzyme and discovered one small but crucial difference. In the active site of the two enzymes (the part of the protein that catalyzes chemical reactions), there is an amino acid known as glutamine. In MPnS, this glutamine molecule binds to iron, an essential cofactor for the creation of methylphosphonate. The glutamine is fixed in an iron-binding orientation by the bulky amino acid isoleucine, which is directly underneath the glutamine in MPnS. However, in HEPD, the isoleucine is substituted by glycine, and the glutamine is free to rearrange so that it is no longer tied to iron. “We were looking for differences that would lead to different products, and that was the only difference that we saw,” Born says. Moreover, the researchers found that converting the glycine in HEPD to isoleucine was adequate to convert the enzyme to an MPnS. By probing databases of genetic sequences from numerous microbes, the team found hundreds of enzymes with the same structural configuration observed in their original MPnS enzyme. Moreover, all of these were identified in microbes that live in the ocean, and one was found in a strain of a very abundant ocean microbe called Pelagibacter ubique. This exciting result builds on previous, related studies showing that the metabolism of the methylphosphonate can lead to the formation of methane in the oxygenated ocean. Since methane is a potent greenhouse gas with poorly understood sources and sinks in the surface ocean, the results of this study will serve to facilitate a more comprehensive understanding of the methylphosphonate cycle in nature. David Karl, professor of oceanography at the University of Hawaii. The role of the MPnS enzyme and its product in ocean bacteria is still unidentified. Methylphosphonates are thought to be added into fatty molecules called phosphonolipids, which are similar to the phospholipids that constitute cell membranes. Another important question is how the creation of methane by these organisms is impacted by environmental conditions in the ocean, including pollution such as fertilizer runoff, and temperature. The National Institutes of Health and the Howard Hughes Medical Institute funded the research.